UPPER EAST SIDE — Parents at P.S. 290 are steamed that a new Citi Bike station has been installed outside of the school — creating a safety hazard for their kids who use the street to play during recess. The new station was installed outside the 311 E. 82nd St. elementary school last week, as part of the bike share's roll out on the Upper East Side. But the placement of the new station is dangerous for students who use the street to play during recess, and where they're picked up and dropped off each day, parents said. Parents were also concerned that the station would draw strangers to the block. Each day, P.S. 290, called the Manhattan New School, closes down the block on East 82nd Street, between Second and First avenues, to traffic. Since the school doesn't have a gym or playground, it has permission from the city to use the street to give students space to play. So parents were dismayed Friday morning to see that on the third day of classes a new Citi Bike station was being installed on the corner of Second Avenue and 82nd Street, essentially in the students' playground. The new station is part of the city's roll out of Citi Bike on the Upper East Side, which comes after months of outreach and public input conducted this year, according to the city's Department of Transportation. The DOT finalized and publicized plans in July. Parent Brian Feldman said many were not aware of the DOT's plans, except those that were in on a PTA email last week that said the station was coming in mid-October. "It is ridiculous to even consider putting it on a street that is already closed off for part of the day," he said in an email. "Random people are going to be walking through the kids' recess to get on and off bikes or riding their bikes through." In protest of the new location, the PTA sent out an email to parents on Friday. "This is not in the best interest of the 650 children ages 4-11 that use the street for recess, drop-off and pick-up every day," the email states. "The staff at P.S. 290 is not equipped to handle the additional burden of making sure that adults walk their bikes safely through the street while the children are using it. Imposing this responsibility on the staff will divert their attention from watching and engaging with the children." 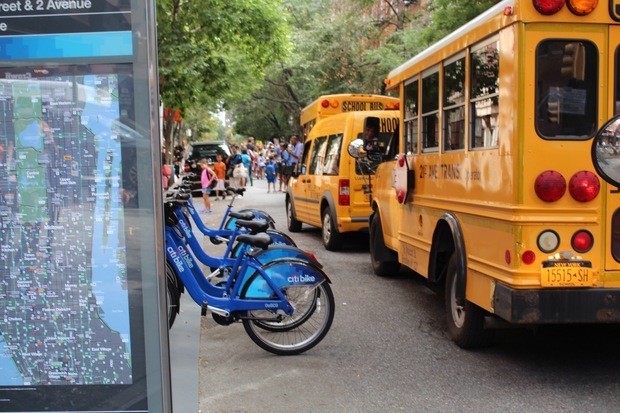 When reached on Friday afternoon, the DOT told DNAinfo New York that there are a number of bikeshare stations near schools and playgrounds — like St. Catherine's Park at East 68th Street and First Avenue that is now open — but the DOT has not seen any issues. The DOT said it will reach out and work with the school, and if any unforeseen issues arise it would consider relocating the station. Councilman Ben Kallos, who attended the Upper East Side's very first Citi Bike station opening at East 67th Street at Lexington Avenue on Sept. 1, said he'll "make sure the DOT comes to the table to hear the community's concerns." "I hope that the DOT and Citi Bike will hear the community here, but I wish that members of the community could have engaged the process when we were doing an extensive public feedback period months ago, because that way there could have been a better result," Kallos said.